Not your average barn. Powisset Farm hosts an intimate cooking class hosted by Leigh Belanger. 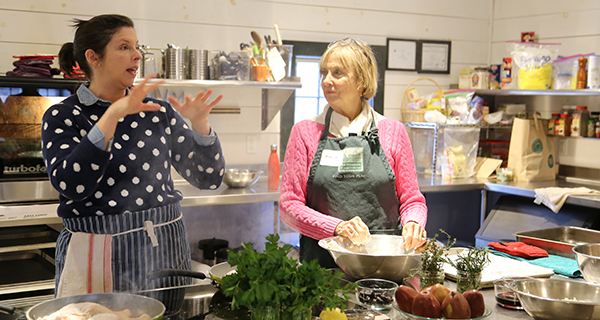 Powisset Farm hosted a cooking class taught by cookbook author Leigh Belanger in their barn-kitchen last Wednesday afternoon. With sauces sizzling and popping, knives clunking on cutting boards, and steam billowing out of pots and ovens, Belanger walked seven students through the techniques and processes of preparing ingredients, cooking them, and arranging them in a delicious and eye-catching way. The class was one of the many cooking classes that take place in the Powisset Farm kitchen throughout each month, each of which has a different ethnic or technique-based theme. 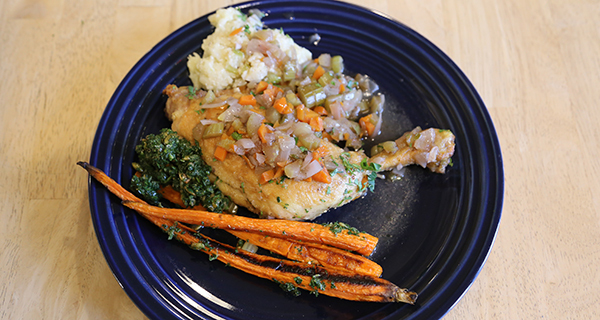 This class focused on European country-style cooking, and consisted of braised chicken, polenta, roasted carrots, and poached pears. A master of multitasking, Belanger cooks, cleans and teaches all at once. Boston-based and educated in the culinary arts, Belanger was just featured on “Chronicle” after the publication of her newest cookbook, “My Kitchen Chalkboard,” which was inspired by her practice of setting a menu of family meals at the outset of each week, and then cooking those dishes for a large and hungry family. Belanger was adept at teaching as she went, breading chicken thighs, guiding a student on how best handle a knife while chopping greens for pesto, then checking a pot of sweating celery while giving quick lecture on how she was cooking it. It isn’t wrong to think that a barn is a strange place to host a cooking class. The finished product on the day: European country-style cooking. To get to the warm kitchen, one passes through what must have served as a stable in another day. There are ribbons on the walls from prize-winning pigs, barn cats peer around corners, and coverall-clad farmhands rumble about the cold fields in ATVs.